Do you like really hot sauces? If your answer is yes, then you need to try Dave’s Ghost Pepper Naga Jolokia Hot Sauce. This is one of the newest addition to the Dave’s hot sauces collection. We have to say that even though is very, very hot –the result is watery eyes!- it has a unique flavor if you try this sauce mixed with dried tomatoes or any other non-spicy sauce. The secret? Ghost peppers! These little peppers add a unique flavor to curries, pickles, chutneys, etc, and are one of the main ingredients of this hot sauce. Ghost peppers are from Asia, particularly from India and people have used them from generations to generations to heat up their typical dishes, such as pork, dried fish, fermented fish. Some people categorize Ghost peppers as the hottest peppers on earth and people in Asian countries even spread them along fences to keep animals away; there you can figure out how hot they are! Dave’s Ghost Pepper Naga Jolokia Hot Sauce is prepared with these ingredients: Ghost Pepper/Naga Jolokia, hot pepper extract, salt, vegetable oil, roasted garlic pulp, acetic acid, plus some other secret ingredients they don´t want to reveal. From this list, we can highlight the fact that the roasted garlic really gives this sauce a unique flavor; some other sauces are prepared with garlic but is not the same flavor as roasted garlic, is the perfect mixture between sweet and savory. The botanical name of these peppers is Capsicum chinense and they have so many benefits and powerful antioxidant properties. The antioxidant constituents in Capsicum annuum promote eye health since their effectiveness at removing free radicals helps prevent macular degeneration. It also has an analgesic effect when used topically to relieve a sore joint or muscle, stimulates the circulation of blood in the capillaries around the inflamed area. It also heats up the area where it is applied, and can warm cold extremities. If you want to try this sauce, but you are scared, try to make this at home first, to get prepared. First, we highly encourage you to wear gloves! Start by removing the stems and seeds from ghost peppers. Combine all ingredients in a saucepan and add water to cover. Bring to a boil, reduce heat to low and simmer for 20 minutes until all peppers are soft. Place in a blender and blend until smooth. 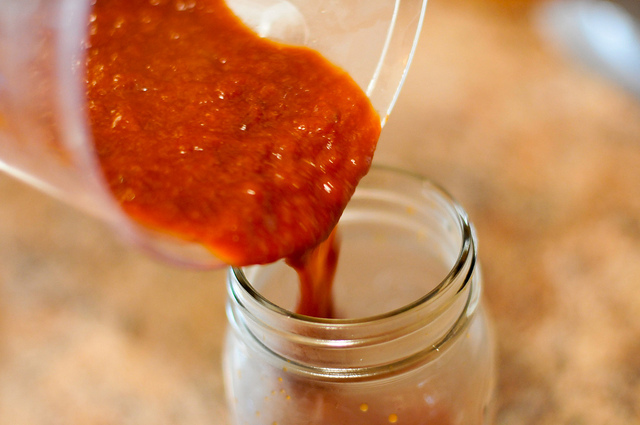 You can add more tomatoes or use this sauce as ingredient for some barbeque sauce. Remember to be very careful and do not touch your eyes!